The complete lamp with cable. A very high quality light fitting designed to be used in a DC powered project. Fitted with a very high quality E27 socket and IP65 gland. Lamp is fitted with 50cm of high grade rubber 2-core cable rated HO5 solder terminated. Lamp reflector / Shade is 7 inches across. We supply these little beauties complete with one of our super bright 'medium white' low energy 3W LED bulbs so that they can be used with virtually any project where a 12v or 24v DC power supply is available. Four of these lamps (fitted with our special 3w led) will use only ONE Amp / 12 watts but produce more light than a conventional 100w lamp - now that's what we call economical and efficient! A complete lighting unit ready to install. With the supplied LED bulb the lamp can work with either 12v or 24v DC. Can be used to provide a good looking but robust interior light source for workshops, stables (especially over stalls), garages and over working areas. 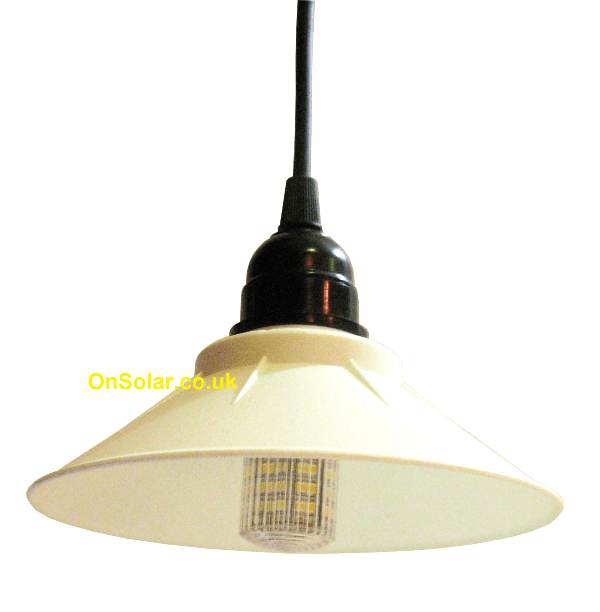 Supplied with powerful OnSolar 3W LED bulb, 50cm 2 core HO5 exterior grade rubber cable, high grade IP65 cable gland / E27 pendant lamp socket and robust 7 inch lamp reflector / shade in white plastic. Please let us know if you require a longer cable to be fitted. See here for more information about our fabulous 3W LED bulbs (as supplied with this fitting).